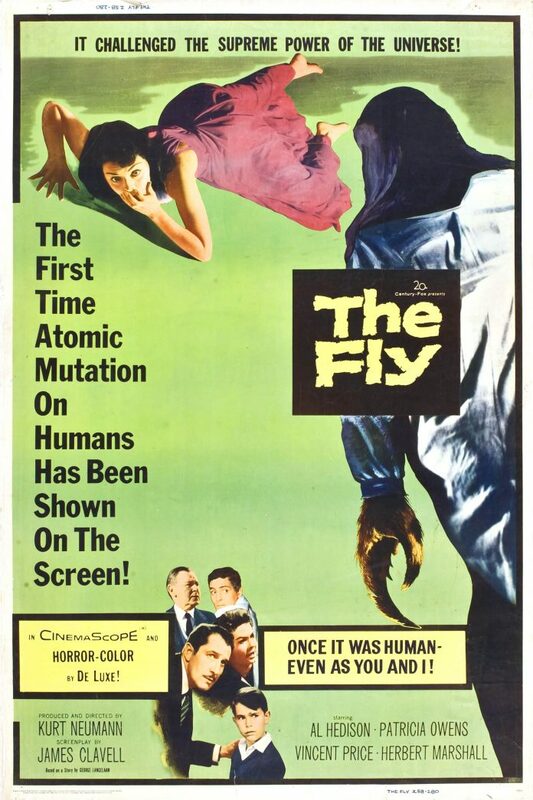 Parodied many times but never quite matched, The Fly (1958) remains a unique film amongst the pantheon of science-fiction thrillers from the 1950s. Despite some occasional slow pacing and some outdated social dynamics (Andre’s son at one point casually remarks ‘you know how women are’), The Fly is well-scripted, features some excellent performances, and has a grandiose musical score by Paul Sawtell. Bathed in lavish, saturated colour tones, and enjoying the scale of CinemaScope photography, The Fly is an elegant horror; a story of ambition and grave mistakes. Arrested for killing her husband Andre (David Hedison), Helene Delambre (Patricia Owens) recounts the strange and horrifying explanation of how her husband came to beg her to end his life. Told in flashback, the film tells the story of how Andre, a brilliant scientist, creates a matter transportation device. An object (or living organism) has its matter disintegrated into its atoms at one location to then be reintegrated at another. First experimenting with just inanimate objects, his ambition gets the better of him as he transports the family cat. The poor animal never reintegrates at the second location, and their atoms are lost to time and space. After a brief success with a guinea pig however, Andre enters the transport himself unbeknownst to his wife. A common housefly is accidentally transported along with Andre, mixing their atoms. The result is a hideous mutation, and a man turned suicidal knowing his mind is doomed to decay. If one were to simply glance at the poster, one may mistake the film for a simpler, more predictable story. On the contrary, The Fly has a thoughtful poignancy that elevates it above what one may assume. The performance of David Hedison as Andre Delambre may come across as smug or overly self-assured, but it this characterisation that makes Andre’s fate all the more tragic. Andre does show a concern for the lives he has played with (those of their cat and the guinea pig) but his concern is minimal at best and is overwhelmed by his curiosity and ambition. Once transformed however, Hedison’s performance becomes strikingly different. With a cloth covering his transformed head, and his left arm almost permanently hidden in his coat pocket, Hedison’s somewhat lethargic physicality and strained gestures amplify how horrific his accident has been. Without seeing what lies beneath that cloth, the audience is made aware of how terrible things have become. Without dialogue, and only banging his fist on surfaces to communicate with his wife, the transformed Andre is a desperate and trapped individual. The juxtaposition of his characterisation before and after his accident is brilliant, and speaks to the subtler approach the film takes with its content. It is, after all, only after sufficient tension is built that we finally see the monstrous thing that he has become. The character development of Andre is perhaps so brilliant partly because it arguably reflects the conflicts of morality and ethics seen in individuals such as Robert J. Oppenheimer. Before the creation of the atomic bomb, Oppenheimer was as eager as any at Los Alamos to see it a success. In the years that followed however, Oppenheimer’s enthusiasm became replaced with a great anxiety about what he created and the mark it left on humanity. Like Oppenheimer, Andre becomes a shadow of himself and what he believed in, turned into something unbearable. The saturated colour photography makes The Fly a visual delight. Every frame of the film is eye-catching. Colour itself is used exceptionally to create the mood and tone of sequences. Andre’s laboratory is grey with blue hues. The dark tones of his machinery and equipment make the location a cold place; fitting for the horror that will unfold within its walls. Andre’s teleporter (when turned on) is anything but dark, with neon green and blue lights erupting from the darkness and bright flashes of pink filling the screen as a person or object is finally transported. The brilliance of Andre’s findings literally leaps out of the dark machinery in dazzling colour. The colour is further amplified by the scale of the CinemaScope photography. The grandiose nature of the Delambre house (not just the laboratory) is captured in full anamorphic grandeur. If there is one point of contention with the camera work however, it is that the opening sequence shows and promises brilliant cinematography. As a night watchman walks through the shadows of the Delambre’s factory, the camera glides beside or before them. It builds momentum brilliantly in an eerie and horrifying sequence. Unfortunately, most of the remainder of the camera work remains static. The shots that do demonstrate movement are mainly panning shots which, although still dynamic, don’t quite visually compare to the brilliant glides of the camera in the opening sequence. 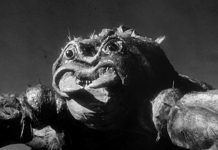 Paul Sawtell, who provided some equally memorable scores for other such science-fiction films as The Black Scorpion (1957) and Kronos (1957) gives a masterful score for The Fly. The main title piece in particular sets one up for the horror to follow. Beginning with a crescendo of brass and horns, the piece moves into strings with a melody that suggests the strange nature of what is to follow. Sawtell’s music is particularly frightening and startling when Helene (and the audience) finally see what Andre has become. What Andre has become is equally something of great merit. Ben Nye (who would go on to produce the test makeups for the original Planet of the Apes) crafted a grotesque fly head with eyes that shimmer with a metallic green hue. Truly, the sight of the transformed Andre is monstrous and very effective. Seeing it is a satisfying (and unnerving) payoff not least because of how convincing the actual fly head is, but also because of how well the screenplay leads up to the reveal. Patricia Owens’ Helene describes the fly with restraint, building tension and pulling the audience in. What was it that she saw beneath that cloth? How hideous must it have been that she actually agreed to help kill her husband? Despite some slow-paced sequences and generally-static camera work, The Fly is a unique and fascinating film. Expectations of characters (and their performances) are challenged. Andre may seem smug and self-assured and that may make one reserved about him as a character, but that characterisation sets up the distinct change (both mentally and physically) that befalls him. The gorgeous CinemaScope and colour photography amplify the film’s imagery and make the fly (once revealed) appear all the more grotesque. The film’s comments on the possibilities of science are simultaneously optimistic and cautionary and that helps the film maintain its poignancy almost sixty years on. First and foremost, The Fly is an entertaining piece of science-fiction cinema, but its central character transformation of Andre gives the film a further significance. 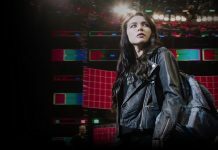 The film becomes a message that discusses how ambition can override one’s caution and in some cases, one’s awareness of others. Just as the cloth that covers Andre hides a hideous mutation beneath, so too does the monstrous visage of the fly hide a cautionary tale.